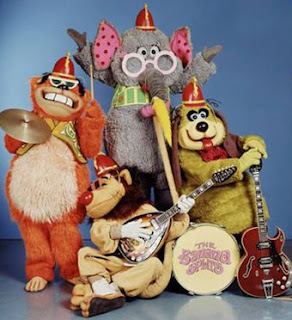 If you were a child in the late 1960's, you will remember the Banana Splits. This Saturday morning tv show was produced by Hanna-Barbera with costumes and sets designed by Sid and Marty Krofft. It ran from 1968 - 1970 and featured four anthropomorphic animals who had adventures (some scenes at amusement parks) and sang bubblegum pop music. A little trivia -- the characters were named Fleegle, Bingo, Drooper, and Snorky. I've included the tv theme song intro below. I think this was filmed at Six Flags Over Texas. Do you remember the Banana Splits? I'd love to hear from you in the comments, below. Oh, this was my favorite kids show when I was little. Every now and then I look up the clips on YouTube. Loved the live action story that was serialized every week, the one with Jan Michael Vincent. Jan Michael Vincent! I had forgotten that detail but I loved the live action story, too. Im an 80s baby so Fraggle Rock was my favorite!